Only 1 Hour and 15 minutes away from the main town of Volos by car, the beauty of Pelion unwinds in front of you from the first moments of your travel towards the village of Agios Ioannis in Pelion. When you travel on the date of your departure prefer the 2nd route: Agios Ioannis – Tsagarada – Milies- Volos, so as to see the other route as well. 2. The 2nd route consists of a combination of a seaside road with part of the road throught the forests of mount Pelion. With a total length of 60 km. (1 hour 41 minutes) this journey reveals the beauty of the inner part of Pagasetic Gulf and the mountain through beautiful and traditional villages such as Milies and Tsagkarada as well as houses built with exceptional local architecture of Pelion. (To get directions of the second route please drag the blue line on the map through Tsagarada village). Any route that you decide to follow are mostly enjoyable! 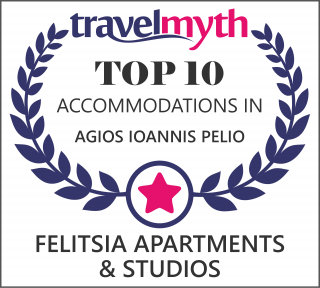 The 2 routes meet together in the village of Agios Dimitrios and in about 3.5 km you will find us – Felitsia Apartments in Agios Ioannis Pelion Greece.